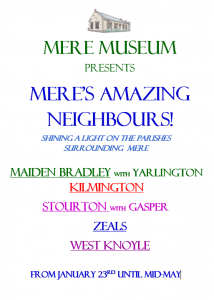 New Exhibition: Mere’s amazing neighbours! We are welcoming in the New Year with a fascinating new exhibition! We’ve called it ‘Mere’s Amazing Neighbours!’ as it shines a spotlight on a few aspects of the history of each of the five parishes surrounding Mere which the Museum also serves. They are West Knoyle, Kilmington, Stourton with Gasper, Maiden Bradley and Zeals. Do come and visit.